Ongoing maintenance. This aspect of warehouse maintenance involves the day-to-day tasks that keep a warehouse humming along: cleanings, safety inspections, and the like. Emergency maintenance. When a pallet falls off the top warehouse shelf, everyone involved in warehouse maintenance – janitorial crew, safety supervisors, forklift drivers and more – are required to pitch in and help. While emergency maintenance is less common than regular and ongoing maintenance, it’s still an important part of warehouse operations. There are also many sub-layers and small elements of warehouse maintenance; regular forklift maintenance is just one example. CertifyMe.net offers a great selection of OSHA compliant courses and certification programs, ideal for employers all across the U.S. Part of our coursework discusses regular forklift maintenance, since it’s required by OSHA. If you want to improve your warehouse safety, become OSHA compliant, and gain some extra peace of mind with your warehouse activities, CertifyMe.net is here to help. But what can you do right now to improve your own warehouse maintenance plan? Keep reading! Unsafe working conditions. From blind spots around corners to bad lighting in dark areas, a warehouse without regular maintenance is a giant accident (or group of accidents) waiting to happen. Poor employee morale. Whenever a warehouse is kept clean and well-maintained, employees are naturally happier. Warehouse maintenance is just another way of telling everyone that the company cares about proper working conditions and has a plan in place to ensure employees are safe. Without a warehouse maintenance program, employees lose focus – and for a good reason! OSHA audits and inspections. Since a poorly maintained warehouse creates an unsafe work environment, the chances of accidents and injuries increase. When accidents occur (and they eventually will), your company is likely subject to OSHA inspections or audits. Once they discover the root of the problem, including a warehouse with poor maintenance in place, be prepared for costly fines and penalties. Remember, per OSHA guidelines, employers must “provide a workplace free from serious recognized hazards and comply with standards, rules and regulations.” This is the foundation of all safe workplaces, including warehouses. And since warehouses contain many hazards not present in most work environments – powered industrial trucks, heavy loads, unloading trucks, etc. – it’s imperative that employers keep their warehouses maintained. What are the best ways to improve warehouse maintenance? Clearly identify potential hazards. Part of a sustainable maintenance plan involves effective hazard avoidance. With that in mind, it always helps to have color-coded warning signs, posters, cones, “restricted” tape, and other easy-to-see markings to stay clear of danger. The more recognizable your hazard warnings, the better. As a general rule of thumb, “go big or go home” with your warning system. If you’re ever audited by OSHA, they’ll want to know what safeguards, if any, were in place. Stay on track. The best warehouse maintenance plan is one that works day after day, week after week, and year after year. A small time investment right now means big savings and a much safer workplace down the road. Skipping routine maintenance might seem like a good idea at the time, but it’s always best to stick with your regular schedule. It’s a team effort. Everyone should get involved. For example, if your warehouse has a light that recently went out, the frontline workers and forklift drivers should report the issue to your safety supervisor or maintenance personnel. The work order should be finished as soon as possible. If they are not, regular checks on warehouse safety conditions will bring it to the surface again. 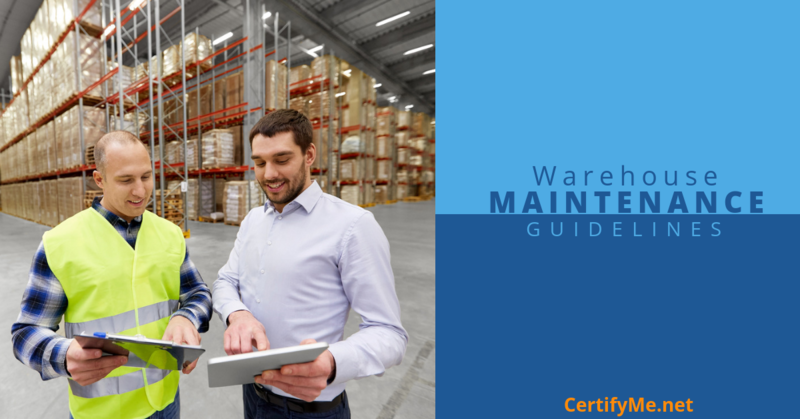 With forklift drivers, safety supervisors, maintenance staff, and others involved, warehouse maintenance is easier than you think! Offer incentives. Small perks and rewards (gift cards, gifts, etc.) for a job well done with warehouse maintenance encourages total teamwork and a long-term commitment to a safer work environment. You can track employee tasks and “above and beyond” duties to help ensure all maintenance activities are accounted for. With some motivation, you’ll be surprised at how easy warehouse maintenance can be. Training and Certification: The Ultimate Forklift Safety Maintenance Plan! If you need to get your employees OSHA compliant, start today with CertifyMe.net. Our training courses are ideal for beginners, advanced-level operators, and everyone in between. From proper forklift safety to common-sense, safety-first operating techniques, we’ll explain how to run forklifts the safest, most efficient way possible. Once your employees are done with the written test, you can print the onsite evaluation forms and conduct your equipment test. Once they’ve passed, simply print out their certification and you’re done. It’s that simple and very affordable, too! To learn more about our safety training courses & certification, or if you have questions about your own warehouse maintenance program and are interested in safety training, call us at 1-888-699-4800.